This photo released by Julien's Auctions shows a custom display of Michael Jackson's signature crstyal glove in five different colors. 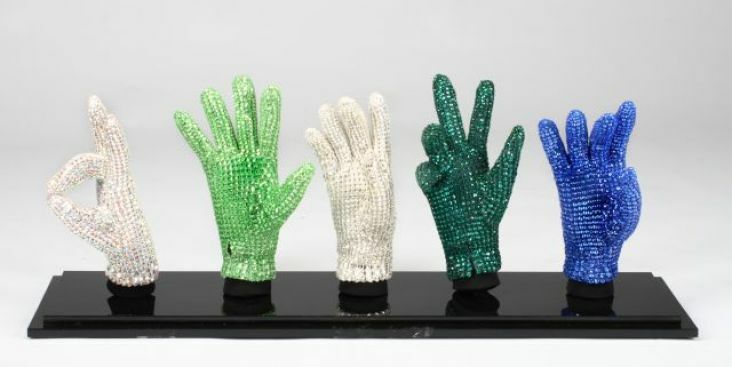 One of Michael Jackson's crystal-encrusted gloves will be on display in Times Square this week in a preview of a planned auction of the pop legend's possessions. Some 2,000 items taken from Jackson's Neverland Ranch are scheduled to be sold on the Auction Network from April 22-25. It is still unclear whether the auction will take place. Jackson sued to stop the sale earlier this month. The auction house says Jackson's managers authorized the sale. A small sampling of items will be on display at the Hard Rock Cafe from Wednesday to Friday.